Not since the emergence of the “Great One” has the sports community been so galvanized by a hockey star until just recently when a young rookie named Gritty came along. 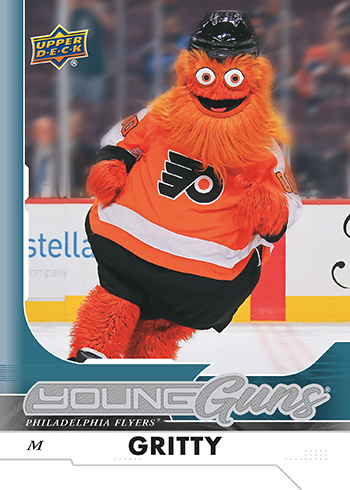 That lovably weird mascot for the Philadelphia Flyers has emerged to become a household name and when you get that big, you deserve an Upper Deck Young Guns NHL® card. Behold!!! Wondering about Gritty’s story? Well that’s why hockey cards have backs! Fans who attend the 2018 Fall Sport Card & Memorabilia Expo in Toronto from November 9-11 can score a Gritty oversize or regular size card while supplies last if they open a sealed hobby box of 2018-19 NHL® MVP or 2018-19 NHL ® O-Pee-Chee. We are not making a tremendous amount of these cards so grab them while you can. 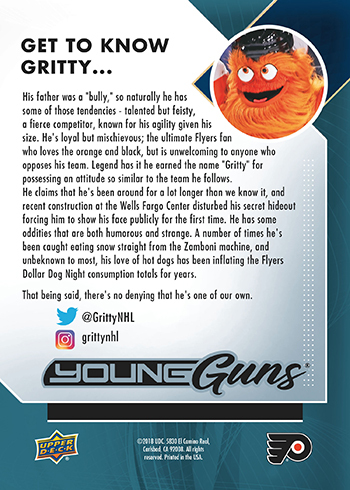 Gritty only gets one rookie card, so this item is sure to be a collectible that people will be talking about for years to come! Oh man, I NEED one of these!! This is awesome. Need to grab multiple ones as me & my family are huge flyers fans! My name is David. I lived in North Carolina all my life. I am a true Flyers, Eagles, and Sixers fan. Always have been and always will be. I am 65 and a hockey card collector. I would like to find a Gritty young gun card but can’t find one where I live. I don’t buy anything on line. How can I get one?